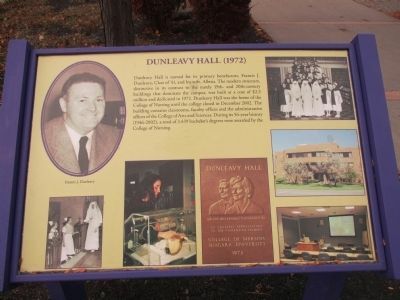 Dunleavy Hall is named for its primary benefactors, Francis J. Dunleavy, Class of '41, and his wife Albina. The modern structure, distinctive in contrast to the stately 19th- and 20th-century buildings that dominate the campus, was built at a cost of $2.5 million and dedicated in 1972. 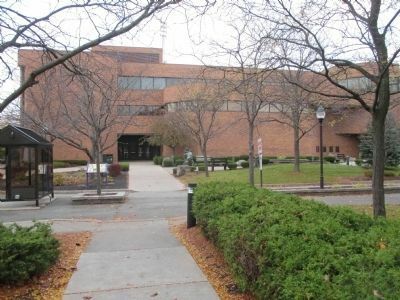 Dunleavy Hall was the home of the College of Nursing until the college closed in December 2002. The building contains classrooms, faculty offices and the administrative offices of the College of Arts and Sciences. During its 56-year history (1946-2002), a total of 3,439 Bachelor's degrees were awarded by the College of Nursing. Location. 43° 8.264′ N, 79° 2.213′ W. Marker is in Lewiston, New York, in Niagara County. Marker is at the intersection of Campus Drive and Varsity Drive, on the left when traveling east on Campus Drive. Touch for map. 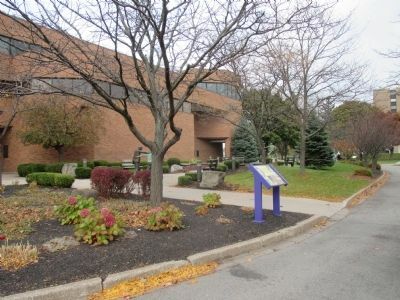 Marker is on the grounds of Niagara University. Campus Drive is not open to vehicular traffic. 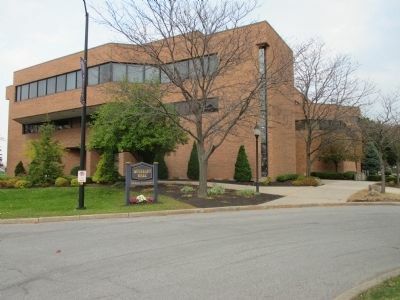 Marker is in this post office area: Niagara University NY 14109, United States of America. Touch for directions. View of marker is split by the tree in the rectangular orafice.
. For God and Country (within shouting distance of this marker); O'Shea Hall (1967), Seton Hall (1970) (within shouting distance of this marker); Varsity Village (1939), Timon Hall (1952) (about 400 feet away, measured in a direct line); The Seminary of Our Lady of Angels (about 500 feet away); St. Vincent's Hall (about 500 feet away); Alumni Hall / Chapel (about 600 feet away); Bailo Hall (1992) (about 700 feet away); Lynch Hall (1927), O'Donoughue Hall (1909) (about 800 feet away). Touch for a list and map of all markers in Lewiston. More about this marker. Niagara University is in the Town of Lewiston but has its own separate zip code. More. Search the internet for Dunleavy Hall. Credits. This page was last revised on June 16, 2016. This page originally submitted on November 4, 2014, by Anton Schwarzmueller of Wilson, New York. This page has been viewed 292 times since then and 7 times this year. Photos: 1, 2, 3, 4. submitted on November 4, 2014, by Anton Schwarzmueller of Wilson, New York. • Bill Pfingsten was the editor who published this page.